Why fail to play AVI files on LG TV from USB drive? From above tablets, we can see that LG TV can playback various video and audio file formats, however, as for AVI file format, it only supports Divx AVI files with Divx3.11, Divx4, Divx5, Divx6, XViD (except 3 warp-point GMC), H.264/AVC, Motion Jpeg, MPEG-4 video codec, and MPEG-1 Layer I, II, MPEG-1 Layer III (MP3), Dolby Digital, LPCM, ADPCM, DTS audio codec. If your AVI files are encoded with other unsupported video or audio codec, you will fail to open them on LG TV from USB drive. To get unsupported AVI files played on LG TV from USB, you will need to perform a codec transcoding process. 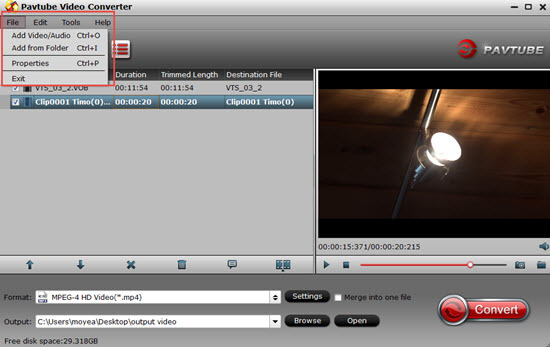 Here, you can get the job easily completed with this AVI to LG TV Converter – Pavtube Video Converter. Which has full support for all 4K/2K/HD/SD AVI video encoded with various different video and audio compression codec. Thanks to its batch conversion mode, you can load multiple AVI files into the program for conversion at one time. With the software, you can easily transcode unsupported AVI to LG TV playable Divx, MP4, H.264, MPEG-1, MPEG-2, VC-1 video audio or MP3, AAC, Dolby Digital, WMA audio codec. For advanced users, you can get better output video and audio quality by flexibly adjusting output video codec, resolution, bit rate, frame rate, audio codec, bit rate, sample rate, channels, etc as you like to get better output video and audio quality. 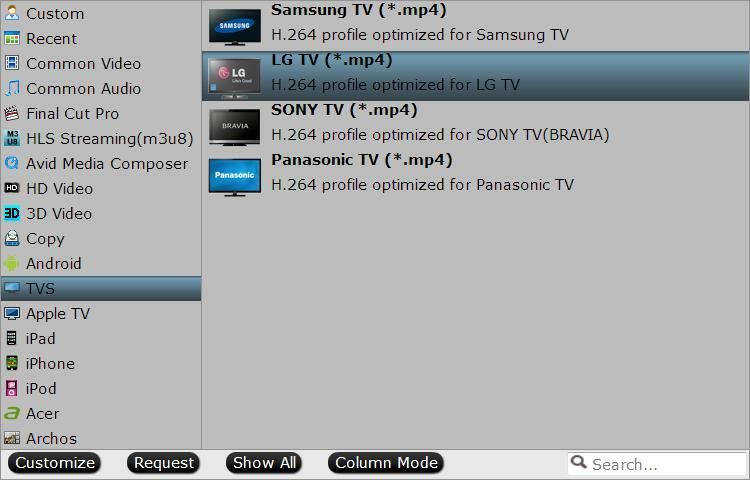 For those people who have no idea how to tweak those settings on your own, you can also use our program to directly output LG TV preset profile formats with the optimal playback settings. For Mac users, please turn to download Pavtube Video Converter for Mac to do the same conversion on macOS High Sierra, macOS Sierra, Mac OS X El Capitan, Mac OS X Yosemite, etc. How to Convert Unsupported AVI for LG TV USB Drive Playback? Launch this program, and click “Add File” button to load the AVI files you want to convert to the software, or drag your AVI files directly into the interface. Clicking the Format bar, from its drop-down list, select one of LG TV playable file formats listed above. Then click “Settings” to adjust other playback settings for LG TV according to your own needs. Here, we choose to directly output LG TV preset profile formats under “TVs” main category. 1. Plug the USB connector of your USB storage device into the “USB 1″ or “USB 2″ port on the back of your LG TV. 2. Press “Home” on the remote control to open the “Home” menu on the television. 3. Push the navigation buttons to highlight “Smart Share” and then press “Enter” to open the “Smart Share” menu. 6. Press “Q.Menu” on the remote control when you are finished using the USB device. 7. Highlight “USB Device” and press “Enter.” Remove the USB device from the USB port when the message appears alerting you that it is safe to remove the device.